The only good night lights are billions of miles away. Answer: Hot air balloons have considerable “steering” capability, and they do it by utilizing the natural variability of wind direction at different altitudes. They can control their altitude but, unlike blimps and dirigibles, have no horizontal thrusters or propellers to control their lateral motion. Lateral motion is driven by the prevailing wind. 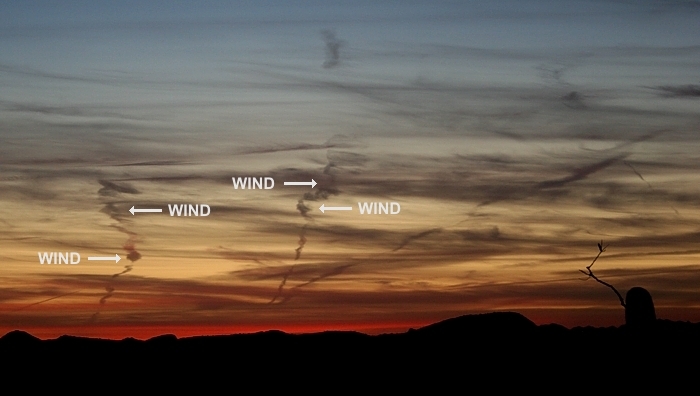 The photo shows how wind direction changes with altitude. Those dark streaks are contrails formed by aircraft, probably launched in California, and now ascending over Arizona. Note how the contrails are stretched left and right by winds as the aircraft climb. I’ve seen similar effects on the trails of meteors which, of course, are heading in the opposite direction. Whatever wind direction you sense at ground level, you can usually find it blowing in other directions higher up. A hot air balloon can reach very high altitudes … the current record is 69,986 feet! Airliners typically cruise around 30-40,000 feet. Most commercial balloon rides (the kind people book just for the fun of it) fly at much lower altitudes. Practically speaking, your average passenger would need an air supply to breathe above 15-20,000 feet. To answer your question: When the pilot wants to change lateral direction, it’s simply a matter of consulting the local NWS database, finding what altitude is needed to reach the desired wind, and ascending or descending to that altitude. So that’s how they steer these things. They can almost always get to the planned landing point, and won’t even launch if the wind directions are unfavorable. My wife and I tried one of those commercial rides. Cost about $150 each. Well worth it for the experience. Here in Arizona, they usually fly under 1000 feet, sometimes skimming along low enough for the passengers to spot wildlife (which is often spooked and flushed by the balloon). We also noticed two interesting physics phenomena during our ride. First, since the balloon is moving at the exact speed of the wind, the air feels perfectly calm. A candle flame would burn vertically, and a feather would fall vertically. Because of this zero relative wind speed, the ride is very quiet. Oh sure … you hear the burner when they turn it on to reheat the air in the balloon, but except for that it’s a nearly silent ride. Second, voices sound weird. When you speak, sound waves are normally reflected from whatever you’re standing on and add to the direct waves that reach your ears. But in a balloon, the ground is too far below and those reflected waves are missing. It’s hard to describe the difference. Why not experience it yourself? Most large cities have several companies that provide the service. In the Phoenix area there’s close to a dozen. I say go for it. You won’t regret spending the $150. And don’t let that YouTube video scare you out of it. Commercial hot air balloons have an excellent safety record. Pilots must be certified and licensed by the FAA, and local operators are familiar with typical flight paths and terrain. The NTSB reports an average of only 20 balloon accidents per year. Considering the total number of flights per year, that’s a lot less dangerous than getting into your car. Next Next post: Pink Snow?